O.Henry Hotel Earns Four Diamonds in Its First Year! We are honored and humbled to gain Four Diamond recognition from AAA in our first year. Only four full-service hotels in North Carolina are so recognized. 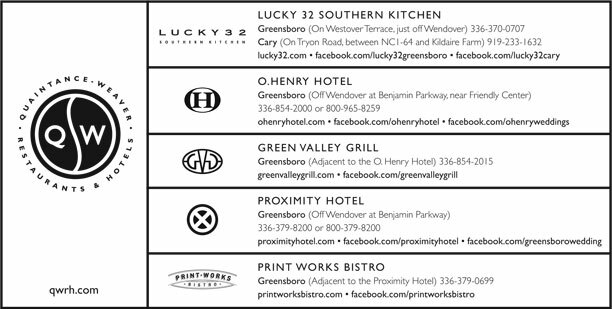 The Green Valley Grill in Greensboro and the Lucky 32 restaurants in Raleigh and Winston-Salem offer outdoor dining. The full menu is available for both lunch and dinner at the Green Valley Grill. Lucky 32 serves the full lunch menu but offers a more limited menu at dinner. We were thrilled with Ralph Grizzel’s glowing article in the April issue of Our State Magazine called “A Perfect Weekend” that featured the O. Henry Hotel and Green Valley Grill. What high praise for him to say that the O. Henry is the centerpiece of a perfect weekend in Greensboro! We not only appreciate Ralph’s enthusiasm, but we appreciate all the wonderful things he mentions that are available just outside our front door – Friendly Center, the Bicentennial Botanical Park, the Bog Garden, the Greensboro Arboretum, and others. If you haven’t checked out an Our State issue recently, we hope you will. It’s a good read. If you’d like a copy of the April article, just let us know and we’ll send you one. Just call Tiffany Cotten at our office 336-370-0966. We are offering a new “pre-order” service for large parties at both Lucky 32 and the Green Valley Grill. The new system of “pre-ordering” for parties of five to fifteen will expedite service and allow you to enjoy your party without a time crunch. Birthdays, congratulation celebrations, office gatherings, and holidays are popular times for parties. “Pre-ordering” for such events allows large groups to order what they want and still dine in under an hour. To take advantage of the service, just indicate at the time you make your reservation that you would like to “pre-order” for the group. You may order anything you like from the current menu – no restrictions. Since our menus change every four or five weeks, we’ll fax you the current menu. The party host simply provides us with the name of each guest and their selection on the fax order form. Orders need to be faxed by 10:30 a.m. for lunch and 4:00 p.m. for dinner. “Pre-ordering” is available anytime with reservations. To get an order form, a current menu, or more information on the service just call any of our restaurants. The phone numbers are on the back page of this letter. Get away, leave it all behind, escape to the hospitality of the O.Henry Hotel in Greensboro. Indulge yourself with the “Enchanted Escape” or the “Elegant Escape”. The newly introduced packages offer you a chance to pamper yourself with gracious hospitality. The Elegant Escape Package begins with afternoon tea upon arrival in the hotel’s social lobby. It features one night’s luxurious accommodations, a box of imported chocolates, a bottle of wine, and a cheese and fruit platter. This package also provides a thirty-dollar credit towards dinner at the Green Valley Grill or Lucky 32, a full breakfast buffet, complimentary transportation to shopping or nearby dining, and late checkout. The Enchanted Escape Package includes all the amenities above, plus a sumptuous two-room suite, a bouquet of fresh flowers, and massages in the suite. Packages are priced per couple, $229.00 for the Elegant Escape Package and $599.00 for the Enchanted Escape Package, and are subject to availability and applicable taxes. For reservations call the O.Henry at 800-965-8259 or 336-854-2000.